Starting your own business is a dream that many Americans hold dear. If you have longed to work for yourself, and not someone else, you understand this desire to take a risk and blaze your own trail. The entrepreneur starting out small and building their idea into a successful company appeals to our love of the underdog. We all root for small businesses to succeed. If owning your own small business appeals to you, how can you turn this dream into a reality? For many Americans, small business represents the American dream, and small business owners are viewed as more honest and ethical than their corporate counterparts. A report commissioned by the Public Affairs Council in 2012 explored the depth of Americans’ love for small businesses. It found that almost nine out of 10 people surveyed had a favorable opinion of small business, with 68 percent saying they would be willing to pay more to work with a small business versus a larger company. Maybe this love of small business stems from the fact that more than 50 percent of the population works for a small business (a small business is defined as having fewer than 500 employees). The statistics show that the U.S. is home to 28 million small businesses, while another 22 million or more Americans are self-employed, without additional employees. What are some of the reasons people feel compelled to leave their positions working for someone else to start their own small business? Some of the common rationales include seeking more money, wanting greater flexibility or desiring the chance to focus on something they love. Whatever the reason, what do you need to consider to start on the path to starting your own small business? Start by writing a business plan. The Small Business Administration is a great resource to help you work through this process. A solid business plan will serve as your map to success, helping you establish a solid framework to build your new business on. You also need to determine what legal structure your business falls under—sole proprietorship, partnership, Limited Liability Company (LLC), corporation, S corporation, nonprofit or cooperative. Once you have a plan in place, it’s time to consider a location. More than 50 percent of small businesses are home-based, but that doesn’t work for every business or every individual. Be honest about what will be the best location to ensure your business thrives and has a future. Finding the funds for your business is the next hurdle. Depending on the type of business you want to start, you can self-finance, utilize government-backed loans, seek out venture capital or obtain research grants. Finally, there will be a fair amount of paperwork and legal issues you will have to consider when starting your own business. From registering your business’s name to obtaining any necessary licenses and permits, make sure you understand all the hoops your particular state and line of business require. This will include registering for the appropriate state and local tax identification, as well as the legalities of hiring employees. 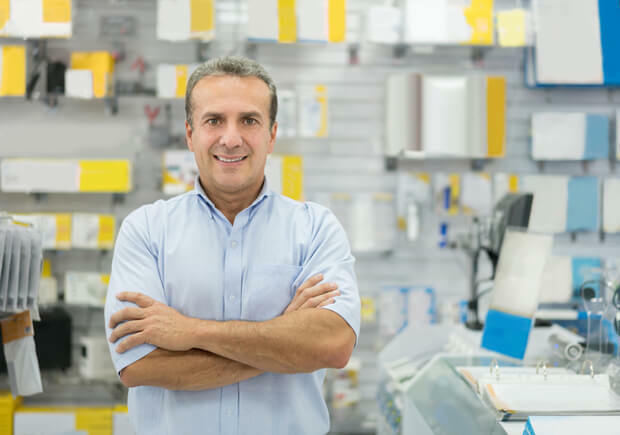 Franchising can be an ideal way for someone to pursue their dream of owning their own business. But just because you have the backing of the franchise corporation—putting you in business for yourself, but not by yourself—that doesn’t mean that being a franchise owner is easy. Some of the benefits entrepreneurs gain from being part of a franchise network include technology, branding and community. Having the backing of a larger organization comes with more advanced methods of ordering, marketing and more, things that small businesses simply may not have the capacity or the liquidity to handle. A franchise organization is there to help their owners with branding and promotion to ensure that you have customers walking through the door. Finally, there is the community aspect of a franchise system, knowing that there are others who have had the same experience you have and who can offer their advice and guidance. But franchising is a partnership, so if you are committed to the thought of answering to no one, it probably isn’t the right path for you. And even if you do buy into a franchise system, you will still be required to work hard to make your dream a reality. There is no easy pathway to success. What solution will your new business be offering? If you aren’t solving a problem with the service you are offering, then what is the purpose of your prospective company? What money must you have to get things off the ground? Starting with a storefront is an expensive proposition. Be sure to explore any way you can begin more slowly, using less funds, and then continue to grow as you begin to make more money. Who is your competition? Investigate if there are others in your area with a similar idea, and then be honest about whether or not there is enough business to go around or if you can offer something better. How will your business be different? We’ve all heard the phrase “special sauce,” meaning what differentiates you from the rest of the pack. If you don’t have something that makes your small business stand out, keep thinking. How can you utilize what you already have to get your small business off the ground? You possess certain resources that could help your company, so make a list of what you have currently that can help you. It could be people, it could be know-how, it could be finances. Do you want to spend your time developing and testing business systems, or would you have more success owning a franchise that provides support and a proven concept? Many people interested in starting their own small business may hold back, thinking the time isn’t right. While there certainly are things you can do to be better prepared, there is no “right time.” Pursuing your own American dream of working for yourself is something you simply make the time right for if your passion is strong enough. But you can be better prepared if you address the questions posed above.